Some flippin mouse wakes me up at 6:00 am rambling on about big doins somewhere or other. I tell him where he can put his cheese, but then realise that we have to get up anyway to go through immigration. Its not really too much trouble after all, today is the first REAL day of our holiday. We are going to Disney World! We all stagger bleary eyed down to Rockin Bar D where immigration is practically a walkthrough. I didnt even need to use my Fastpass. We then have an hour and a half to kill before 8:00 am, which is both breakfast time and the time we have to leave the stateroom. We wander around the ship having a last look and eventually gather together our hand luggage and make for Animators Palate for the last time. Breakfast over, we bid farewell to Liam and John as they hug the ladies and shake my hand. Thank God they got that the right way round! Debarkation is just a matter of walking off the ship, collecting the luggage from the colour controlled zone and passing through customs. Across the road we wait in the car park for our limo. It turns up bang on time and we set off for Orlando. A brief grocery stop sees us $62 poorer and, no, it wasnt all on beer. Just some of it. Check-in at the Beach Club Villas is very swift and our studio is already available. Unfortunately we dont get the Epcot view we requested. We are in room 332, which has a pleasant view of a wooded area and is wonderfully quiet. Unpacking is done swiftly and by midday we are fully at home. By this time the women are flagging. I suggest they get their heads down for a couple of hours as we are all off to the California Grill tonight and we dont want any tired teddies now, do we? Me ? Im rough and tough and hard to bluff and Ive got beer to keep me going. I sit on the balcony enjoying the shade from the midday sun, writing my trip report and listening to the birds and insects. Lovely! OK, thats the report up to date, now Im off for a wander round to check out our new home. See you later. Now that was very nice. It reminded me why I enjoy the DVC so much. I just strolled about checking out the Beach Club Villas and Yacht and Beach Club, then around the Boardwalk. Stormalong Bay is packed, I dont think I saw an empty sunbed, but the quiet pool at the Villas lives up to its name, quiet. The flowers are blooming, the gardens immaculate and everything is spick and span. Its strange, but the cruise has really worn everyone out. I never thought we would go to WDW for a rest! After the relative confinement of the ship, everything seems spacious and quiet. Back in the room the ladies have now been asleep for 1 ½ hours, except for India who is sitting on the balcony reading. I join her and enjoy a quiet beer. Oh yes, there are all sorts of beers you know. Quiet beers, loud beers, sad beers, happy beers, beer to make you forget, beer to help you remember. But this particular beer is exceptional. Sitting with my daughter chatting about WDW with no one else around and the only sound is the noise of the birds chatting to each other. Life in a moment. The other 2 wake up not long after and we go over to Spoodles take out window for pizza. As we sit to eat it starts to rain. Not drizzle, but the sort of Florida rain that bounces back off the floor. 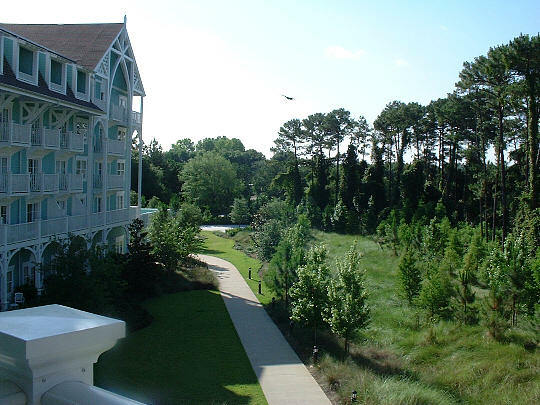 It only lasts 15 minutes or so and we walk back along the Boardwalk and the back to the Beach Club for some relaxing time around the quiet pool. After about an hour the sky goes very dark, so we return to the room for a shower. 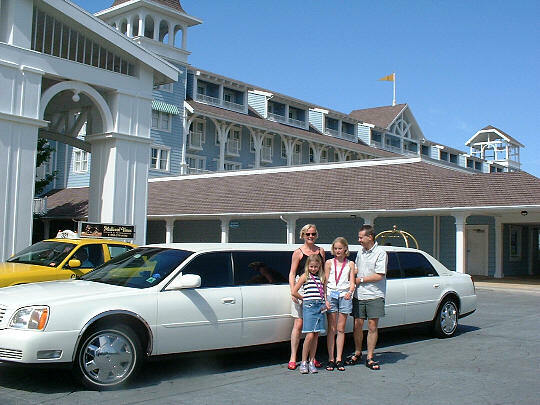 We go out around 6:00 pm and take the bus to the Magic Kingdom. There are people everywhere. Part of me is sad that we are not going in tonight, but part of me is glad. We take the little boat across to the Polynesian. Its always a lovely way to travel. I truly feel that Im back in Disney World. We dont have much time to look around the Poly before catching the monorail round to the Contemporary, but this doesnt matter, just using the various WDW transportation methods is fun. Up to the 15th floor and the California Grill. Its the same as ever. Packed with people, but this adds to the buzzing, lively atmosphere. We see Mark and Mandy and join them for a drink. I feel a bit sorry for them really. I mean, how happy would you be if you came away on your honeymoon and kept bumping into the Stringer family? Still, Mark buys the drinks. See, I told you he is a good man. Our PS is for 8:00 pm, but I ask for a window table and Im told the wait will be 45 minutes to an hour. Thats fine, time for another beer and to enjoy the magnificent views. We are seated just before 9:00 pm and we could not be better positioned. We are the far end of the restaurant with a perfect view, not only of the castle, but also Epcot and the Seven Seas Lagoon. We start our meal with the Portobello Mushroom Flatbread with gorgonzola, spinach and red onion marmalade. Lovely. The girls both have the childrens sirloin steak, which looks normal size to me. Tam has yellowfin tuna with fragrant rice and a Thai coconut sauce, while I go for the chicken breast in a honey mustard sauce. Both are incredibly flavourful. They get the combination of sweet/sour just right and the varying textures are a joy. A fine glass of wine is the finishing touch. The only disappointing thing is the dessert. The strawberry shortbread is a little bland and not as good as the one we had on the cruise. The girls have rice crispie sushi, which looks very much like the real thing, but made with rice crispies and gummi fish. Half way through the meal the lights dim and the music starts as Fantasy in the Sky explodes in the sky. Its a lovely thing to see from this height, but amazing how far away the fireworks really are from the castle. When you look from Main Street they look really close. The meal complete, the bill for $135 (with tip) comes as a real shock after all the free food on the cruise. The California Grill remains up there as one of my top 5 Disney restaurants. Tam is too tight to pay the $15 for a taxi, so we walk across to the Magic Kingdom to catch a bus. Its 11:00 pm, but there are still quite a few people queuing for the buses, especially at the All Star stops. If it wasnt for the DVC that would probably be me. Our bus doesnt take long and is about half full. There is something incredibly soporific about the buses late at night. They turn out the lights and you get lulled to sleep in the darkness. Back in the room we are all in bed and asleep by midnight. Were home.